In a newly published study, Yale scientists reveal that the overexpression of a protein called renalase in pancreatic cancer plays a critical role in spurring the cancer’s growth while also providing a possible new target for attacking the tumors it helps develop. Pancreatic cancer is one of the deadliest cancers, causing about 40,000 deaths annually in the U.S. It is difficult to detect, and most cases are diagnosed at later stages. While there has been some progress in using chemotherapy against the disease, it remains largely resistant to known therapies. The overall five-year survival rate for patients is less than 5%. This is why the study’s lead author, Gary Desir, M.D., professor of Medicine, is so encouraged by the findings. Desir is no stranger to renalase, having discovered and named it in 2005 in his Yale lab. From the beginning, Desir and his team were interested in exploring whether renalase in the circulating in the blood could serve as a biomarker for cancer after noting many cancer cells synthesized and secreted it. As they developed methods to synthesize renalase by making antibodies to measure its expression, they determined that it functions as a growth factor with a critical role in pancreatic cancer. This led to the discovery that renalase’s behavior held clues to its vulnerability as a target for new drugs. 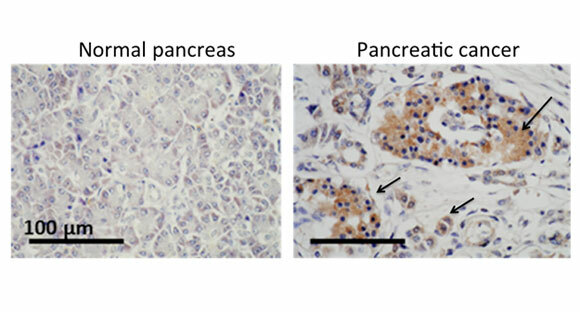 1 Comment on "Yale Study Shows Key Protein In Pancreatic Cancer Growth May Also Be Its Undoing"
Pancreas is a wonder body of the animals where a number of different type of cells like alpha cells , Beta cells etc are created in one organ and it is also capable of conversion and proliferation of these cells to different extent. For example, in DM-Type I , the beta cells are almost depleted and increased storage of glycogen in liver is caused by the alpha cells. Being multi-functional it is also liable to be cancer prone like prostrate glands, mammary glands bone marrow etc. Attempt to regulate the protein renalase , related to renal function in the pancreas is good to protect the organ , since renalase is both protective and destructive. thank You.